A few weeks ago we had a little contest on the Ask Your Dad Facebook page. I promised that if we hit 5000 likes I would share my most embarrassing childhood photo asked readers to do the same. Whoever shared the most embarrassing photo got to pick who I featured on Five Dollar Friday. Ladies and gentlemen, I present... our indisputable winner. 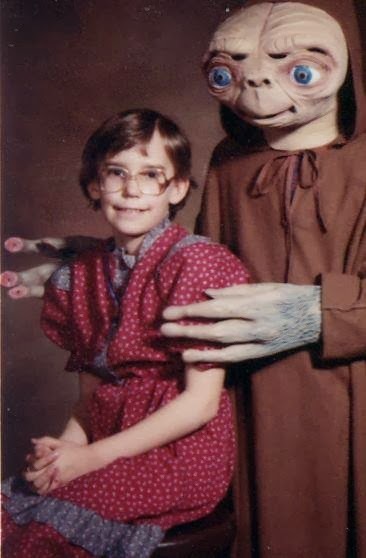 Through Jennifer's willingness to share her incredibly creepy ET picture with us, and her subsequent victory, I had the honor of getting to learn a little bit more about Jaxon. Jaxon is the son or Jennifer's friend. He was diagnosed with brain cancer, and passed away in November of 2012, but not before leaving an amazing footprint on the world. Here is his story, as told by his mom. After 500 seizures in a 3 month period, our 3.5 year old son, Jaxon, was diagnosed with brain cancer. Jaxon went through brain surgery, 8 weeks of radiation, 6 different chemo drugs, numerous transfusions, received anesthesia 50+ times and swallowed thousands of pills. For 2 years Jaxon battled this horrible disease, and yet his focus was never on himself but instead on how he could help the other kids at the hospital. Jaxon was constantly doing fundraising and purchasing items for other sick kids. He gave welcome gifts, CDs, toys, wall decals, nightgowns, and sponsored custom painted shoes for other kids. Jaxon's huge heart was recognized across the world as he spread kindness to others even in the midst of his own battle, and he was inducted into the Pay It Forward Foundation Hall of Fame in 2012. As busy as Jaxon was brightening the world for other sick children, he still had a big wish of his own. 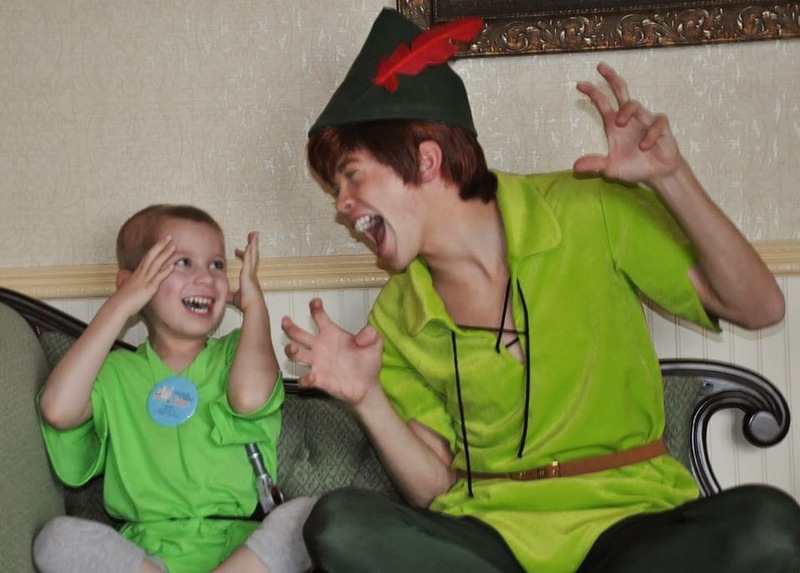 Jaxon loved Peter Pan, and Make-A-Wish arranged for our family to go on a weeklong vacation to Orlando to meet Peter Pan as well as tour the parks in the area. The trip was nothing short than amazing, and our pay it forward kid was showered with kindness throughout the week. 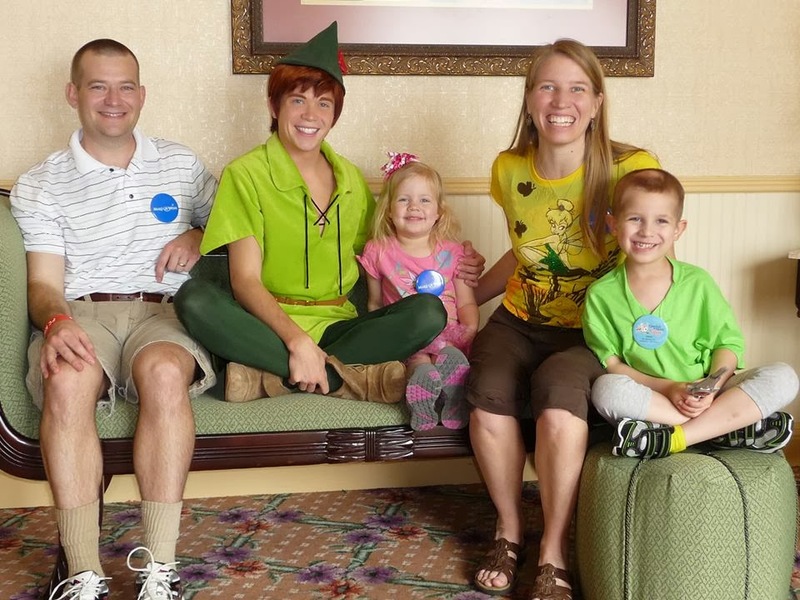 Peter Pan spent an hour with just our family in the wish lounge. 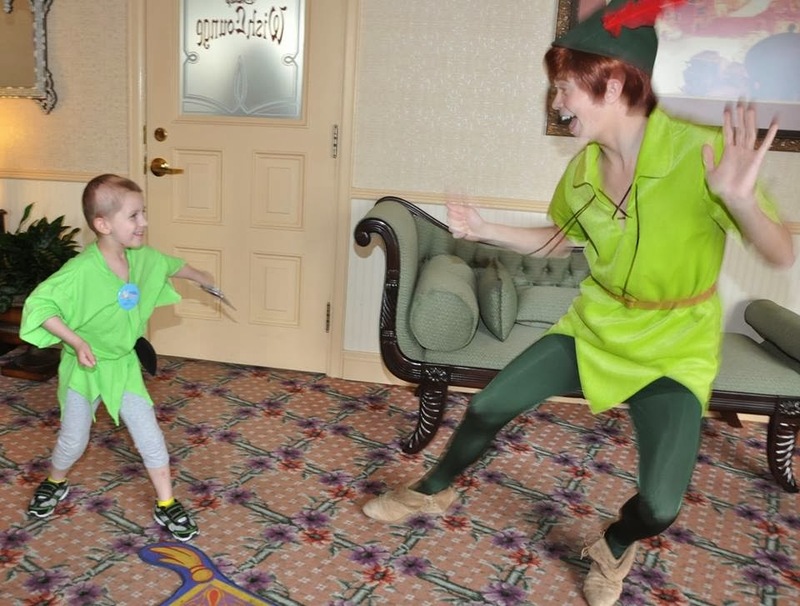 Jaxon loved pretend sword fighting and crowing with Peter Pan, and at the end of the visit, Peter Pan escorted Jaxon and his sister across the park to the front of the ride, Peter Pan's Flight. 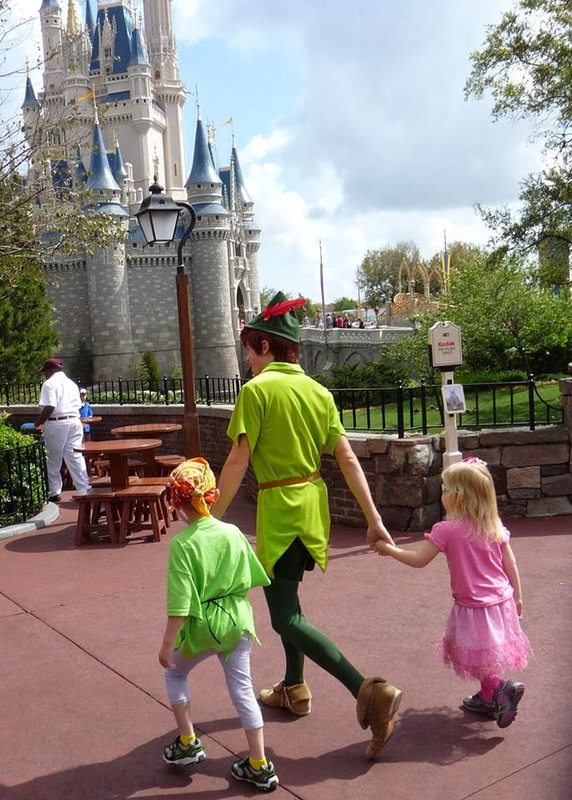 Throughout Jaxon's journey, no one ever wanted to be in our shoes, but as we walked through the park with Peter Pan holding the hands of my children, everyone wanted to be us. Jaxon's condition got worse, and eventually he lost his mobility and his vision. Yet even toward the end he still continued to serve other sick kids including feeling along the edges to pull strings through holes making no sew blankets for kids at the hospital. The Sunday after Thanksgiving of 2012, Jaxon took his last breath on Earth, and his 1st breath in Heaven. Jaxon's legacy continues through the ministry he started, Jaxon's FROG Foundation, a 501(c)3 non-profit dedicated to bringing joy to children battling cancer or on hospice care. The smiles and laughter our family experienced with our son on his Make-A-Wish trip continue to be priceless memories. In fact when deciding what to do for what would have been Jaxon's 6th birthday on Earth, we decided to take our daughter back to the places we visited on Jaxon's wish trip to remember the special times we had with him. Jaxon's FROG Foundation pays forward part of our donations to a few select non-profits, and Make-A-Wish is 1 of them! On my 1st birthday without Jaxon here, my brother and I went "Over the Edge" with Make-A-Wish, rappelling down a 32 story building in downtown Austin to raise funds for other children to get to experience the magic of having their wishes granted. I'm not advocating a 32 story rappel for most, but EVERYONE can definitely contribute at least $5 or $10 towards making a child's wish come true! So there you go! This week's Five Dollar Friday has two options. If you would like, you can donate to Jaxon's FROG Foundation or directly to The Make a Wish Foundation. Or both. OK, three options. Thanks for reading! To learn more and contribute to Jaxon's FROG Foundation click here. To donate to both of them, don't click here. Just click the two links above this line. I love the Make-A-Wish Foundation! We've been working with them as a family since 2005 since my younger brother got granted a wish to go to the Conan O'Brien show in NYC. Thanks so much for promoting them and their wonderful charity! Thanks for sharing Jaxon's story. We feel honored to have granted his special wish, and to have had the chance to get to know his amazing family. We appreciate all their support and the wonderful work they do through Jaxon's FROG Foundation. Thank you!